Please refer to our stock # 10769 when inquiring. Born 1846 in Upperville, Lucien Whiting Powell served with the Virginia cavalry during the Civil War. After attending the Pennsylvania Academy of Fine Arts, Powell moved on to the London School of Art by 1875 where he was strongly influenced by the atmospheric painting style and romantic subject matter of J.M.W. Turner. Powell eventually settled in Washington D.C. where he had a series of different studios, the most noted one at Henderson’s “Castle” on 16th Street owned by his formidable patron, Mrs. John B. Henderson. Perhaps with a certain proprietary attitude towards the artist, Mrs. Henderson owned some 200 of his watercolors and works on canvas and funded his tour of the Middle East in 1910. An avid traveler, Powell also toured the American West in 1901. 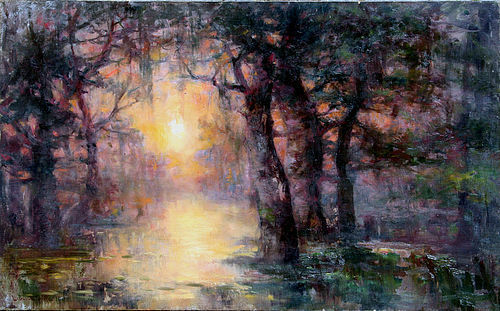 His best known works are landscapes of the Grand Canyon as well as land- and seascapes of Venice. In Street Scene in Florence, Italy, a casual gathering of women proffer goods under cloth and wooden awnings in an open square. Powell’s warm, earthy palate and loose, painterly rendering reflect his admiration of Turner. McMahan, Virgil. The Artists of Washington, D.C. 1796-1996** For other paintings by artists from Maryland, Virginia or Washington DC, type “local” into the search box.